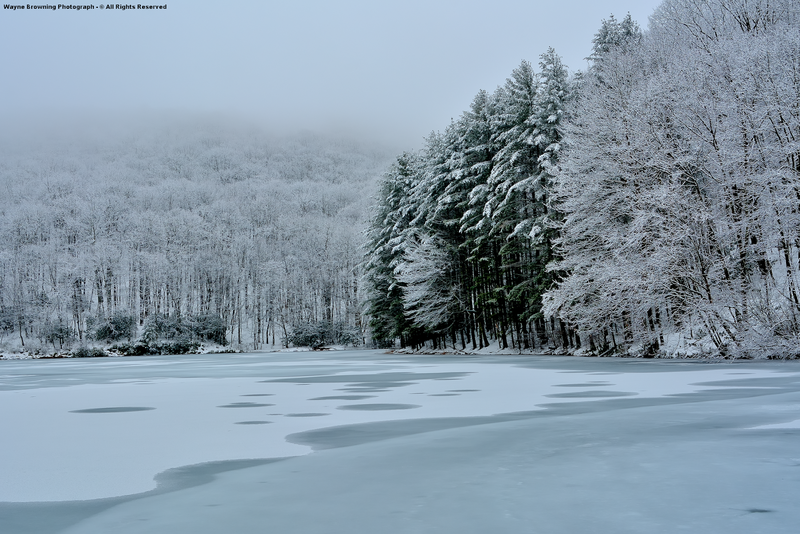 is best to view these photographs in a dark or dimly lit room. 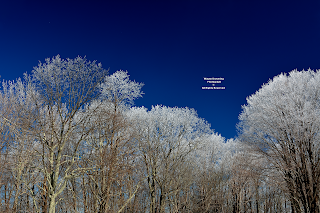 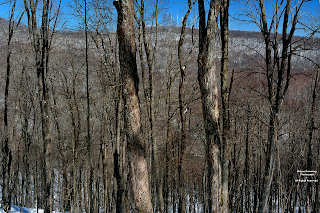 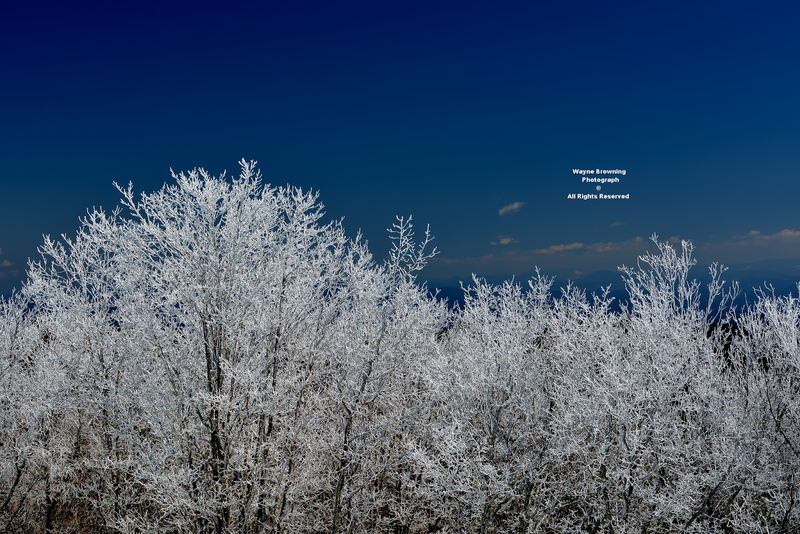 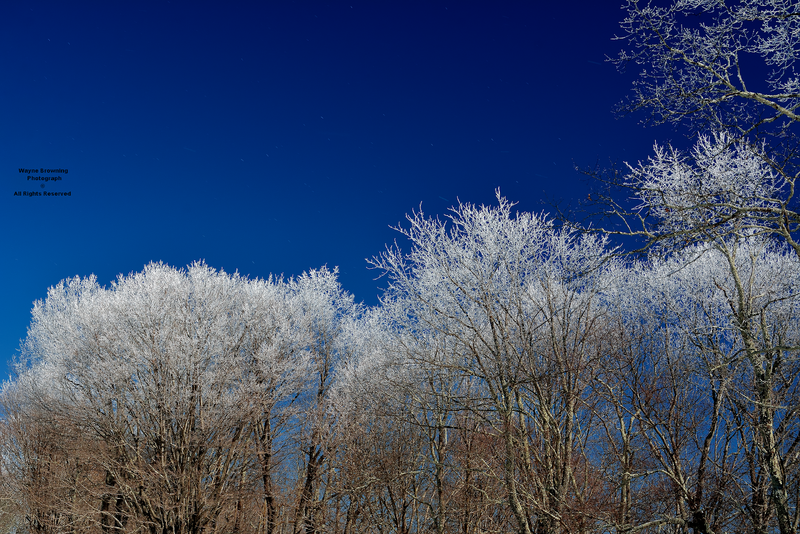 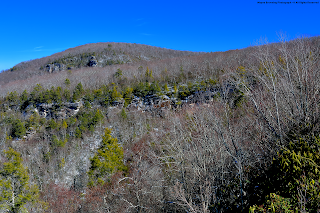 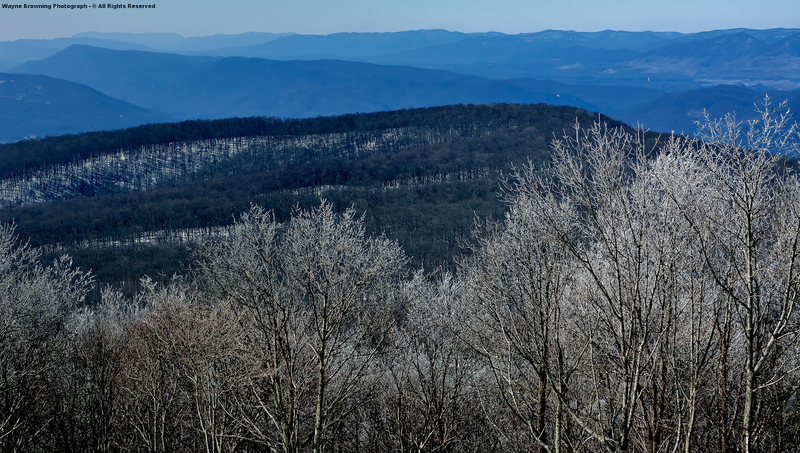 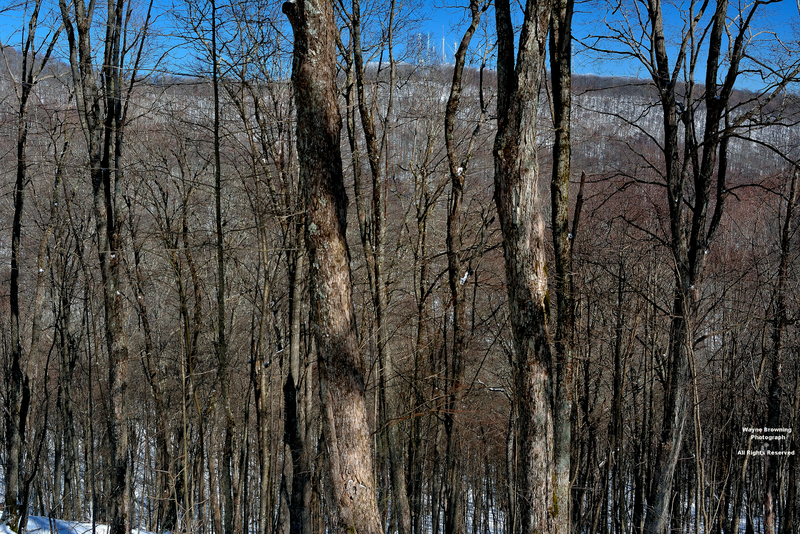 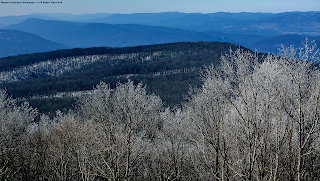 High Knob Massif after morning clouds dissipated on February 27. 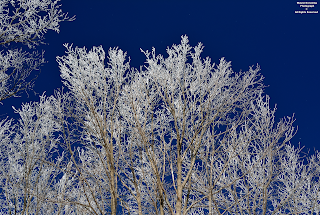 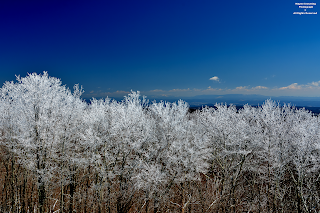 Although snow had settled and was melting, with rime having dropped at lower elevations, the crest zone held on to enough to generate pure majesty against deep blue skies. If you want to take really pretty photographs in conditions like this it is best to use a high quality circular polarizing filter ( one that will not degrade your picture quality ). This helps accentuate blueness in the sky and is maximized the closer you can shoot with the sun directly to your back. 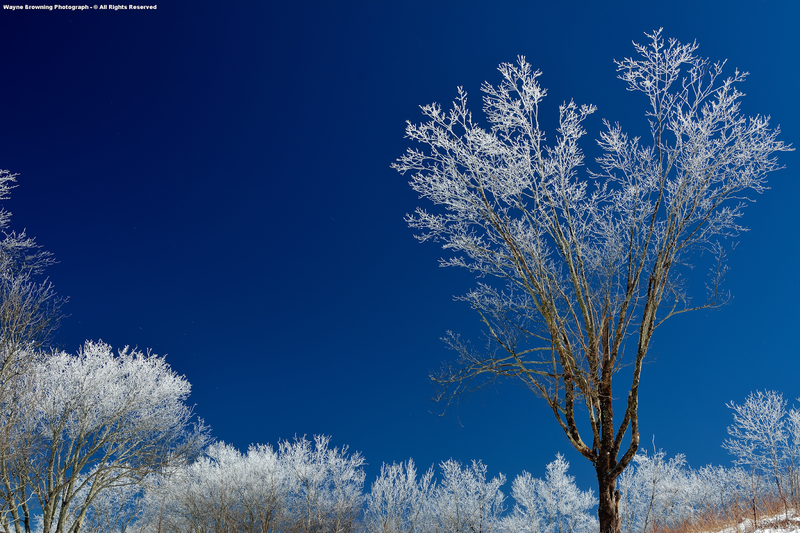 The magnitude of "blueness" can also be controlled, of course, by rotating the filter as you shoot scenes at different angles. 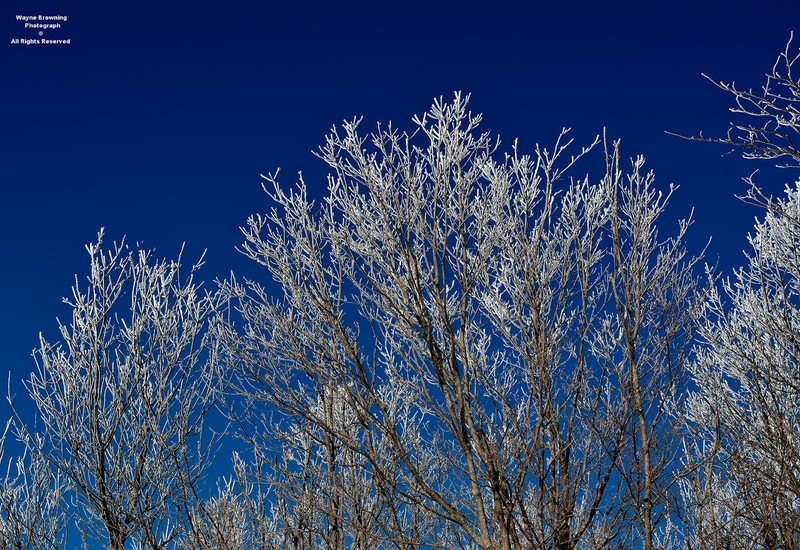 the blue in weather conditions like this. 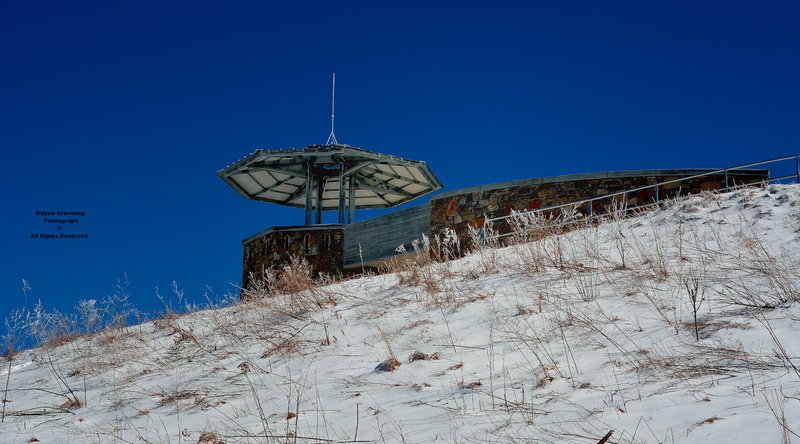 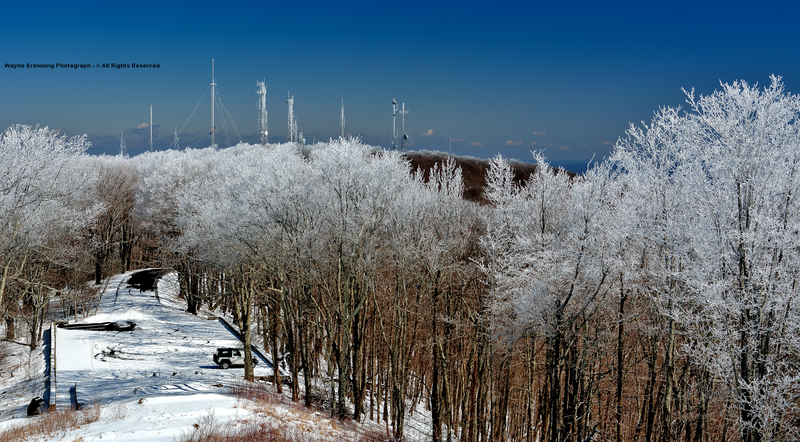 the Eagle Knob Communications Complex. 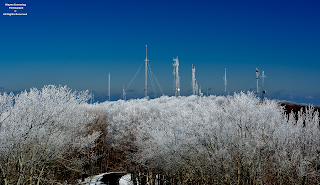 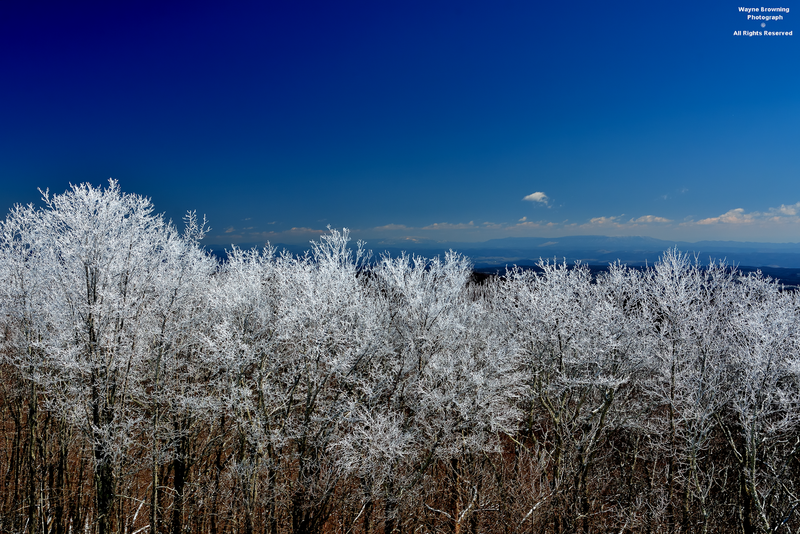 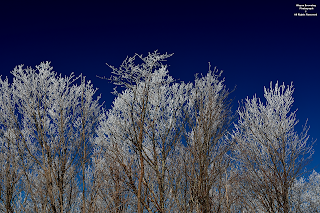 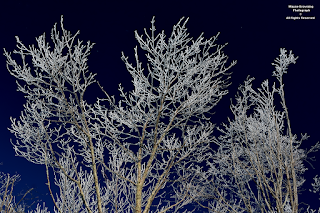 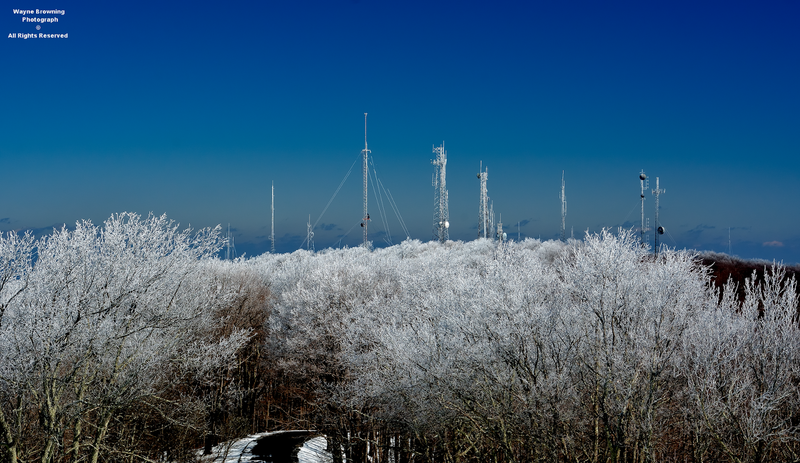 Rime could be seen on the higher sections of Brumley Mountain, above Hansonville, and also along the crest of Russell-Beartown Mountain to the northeast. 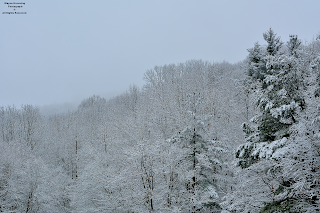 Snow drifts lee of the high crest lines were widespread and generally 8" to 16" in depth, despite significant settlement during the past couple of days. 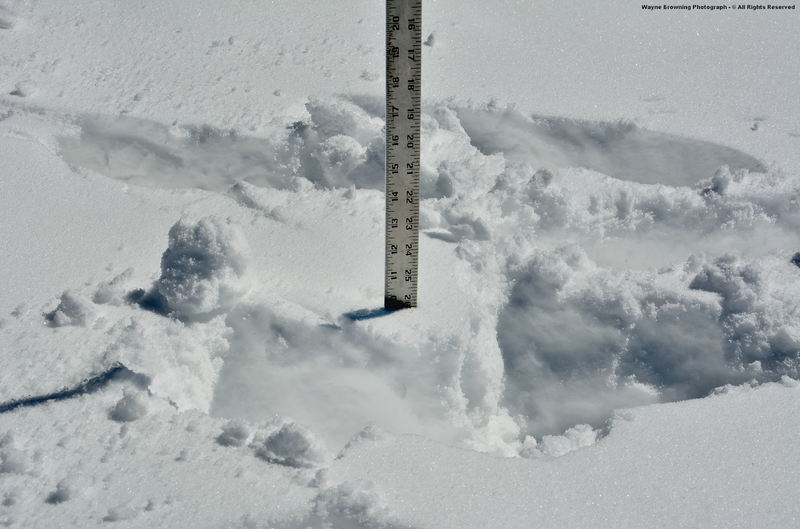 1-2 foot drifts and general 5" to 7" depths ( around 0.68" was estimated from a snow core to have fallen during the snow ). 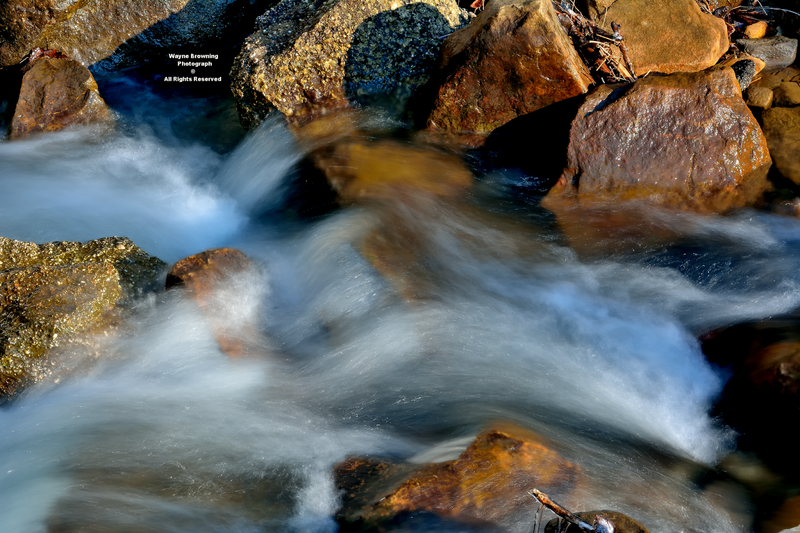 becomes the main problem! ). 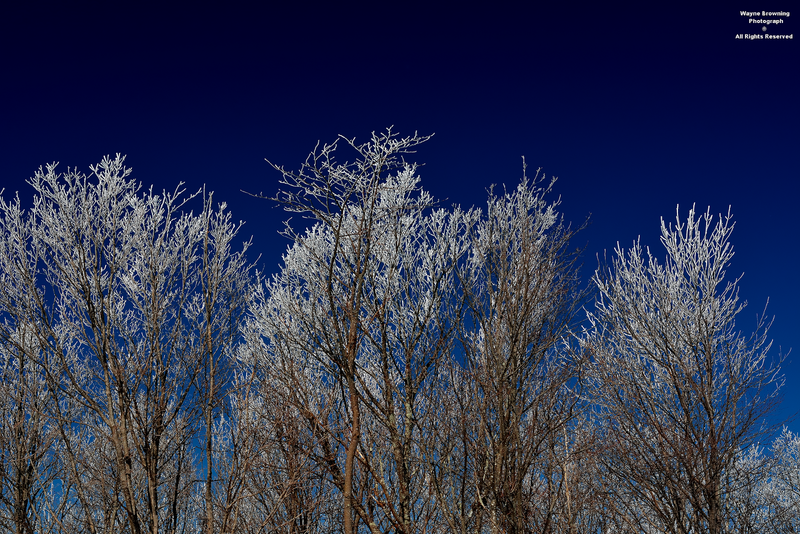 A nearly black sky created with the polarizing filter, and the sun directly behind my back, helped set the rime against a poster-like background. 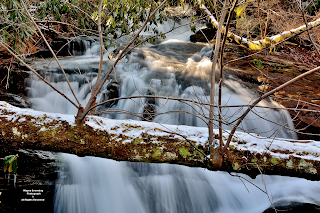 I started the morning by shooting cascading whitewater on Benges Branch, where water continues to gush downward out of the high country. 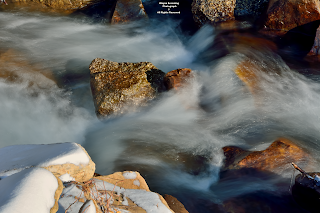 I shot the whitewater while waiting on my friend and photographer Bill Harris to arrive from Big Stone Gap, for our trip on upwards into the rime zone! 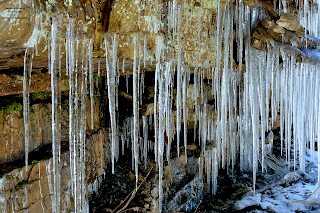 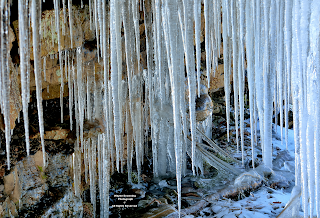 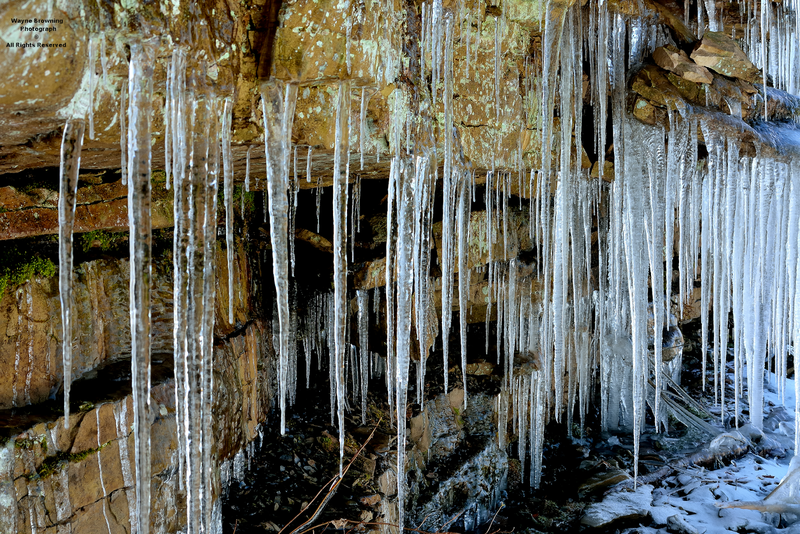 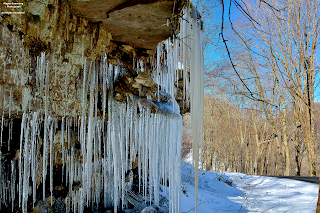 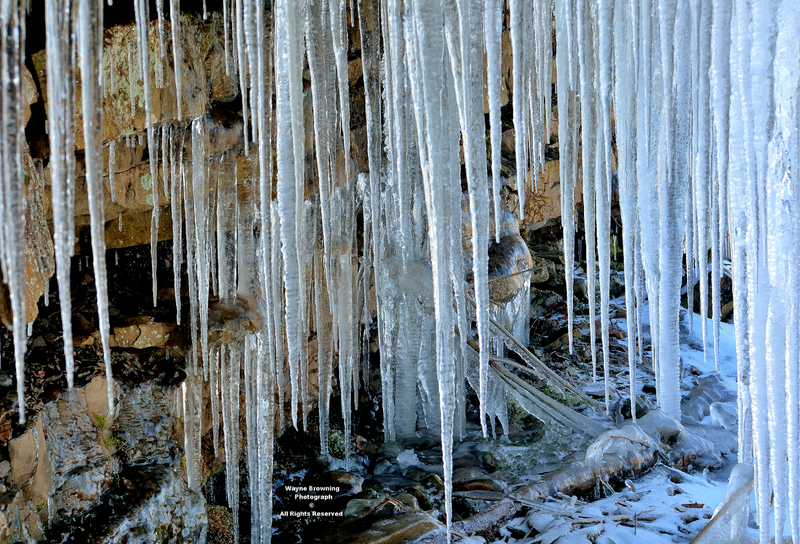 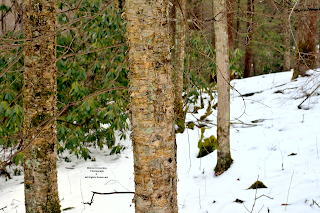 We found some diverse scenes, including icicles longer than I am tall hanging off cliffs between the peak of High Knob and Camp Rock Meadow. 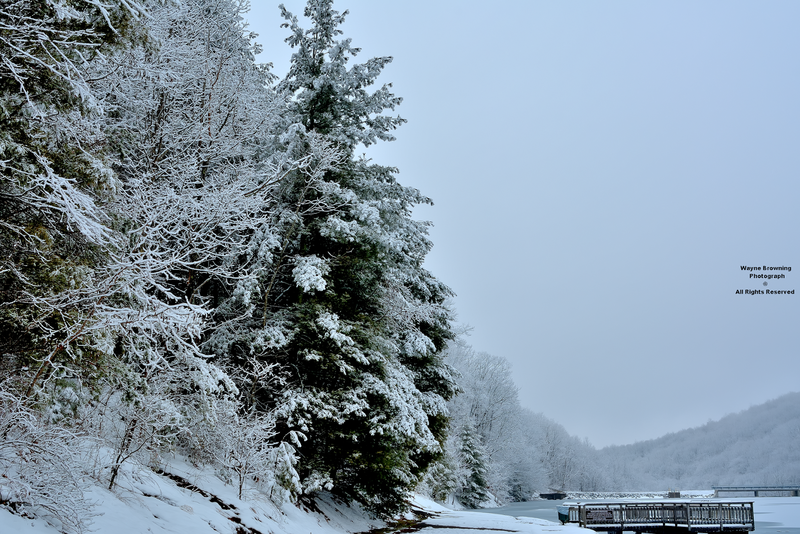 The City of Norton decided to open the gate to their Flag Rock Recreation Area, so Bill & I stopped for a few afternoon shots. 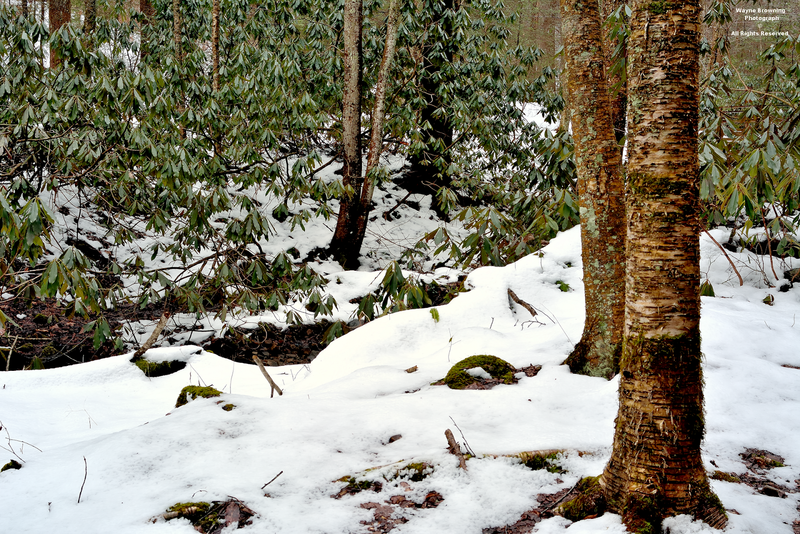 Snow was melting fast below 3000-3300 feet in elevation. Whitewater could be heard gushing out of Benges Basin, below this Overlook, as it drained downward from the Dual Norton Reservoirs ( enhanced, of course, by melting snow ). 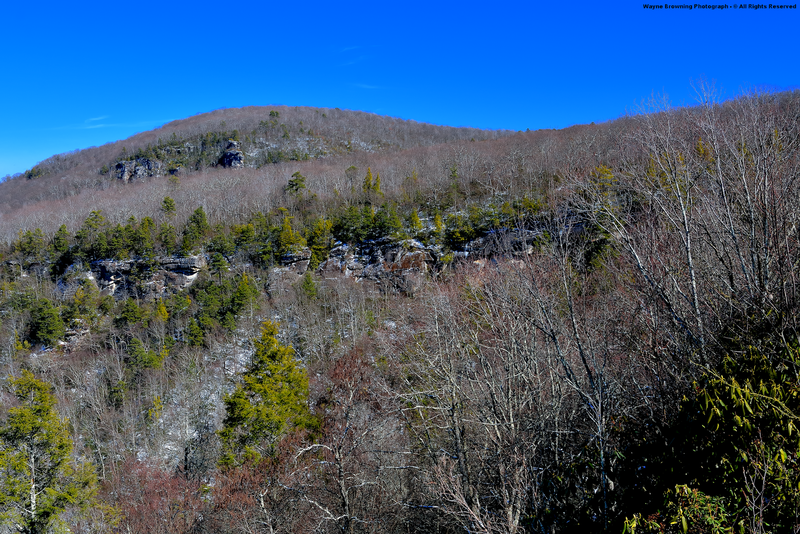 The main stem of a 41.9 square mile multi-gorge wonder originates above, in the High Knob Lake Basin, with a stream gauge in lower sections of the 13 mile stream course, in northern Scott County, on Big Stony Creek serving as a nice guide for run-off from the many steep creeks draining the massif. 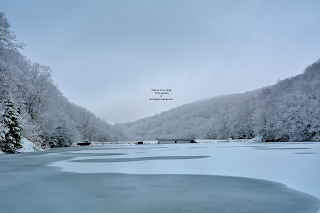 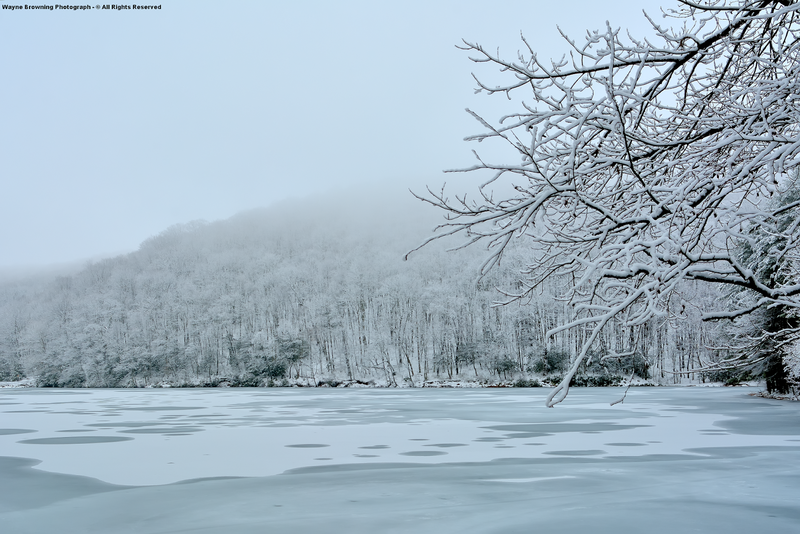 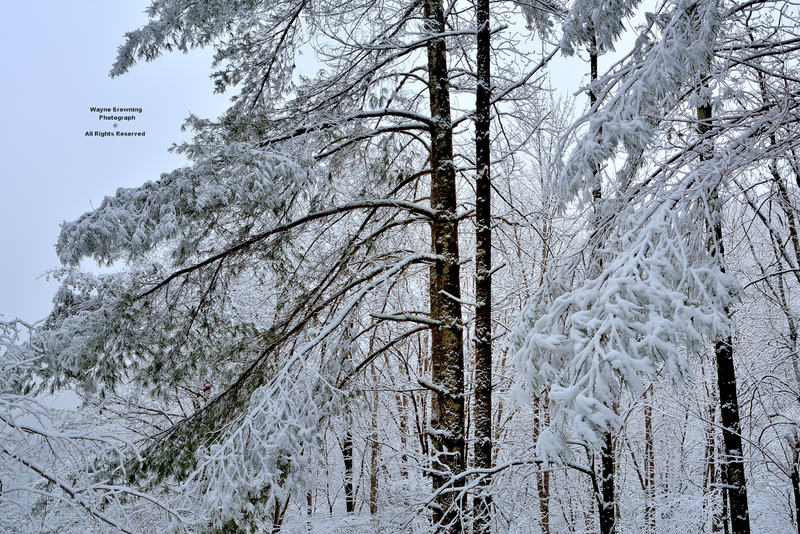 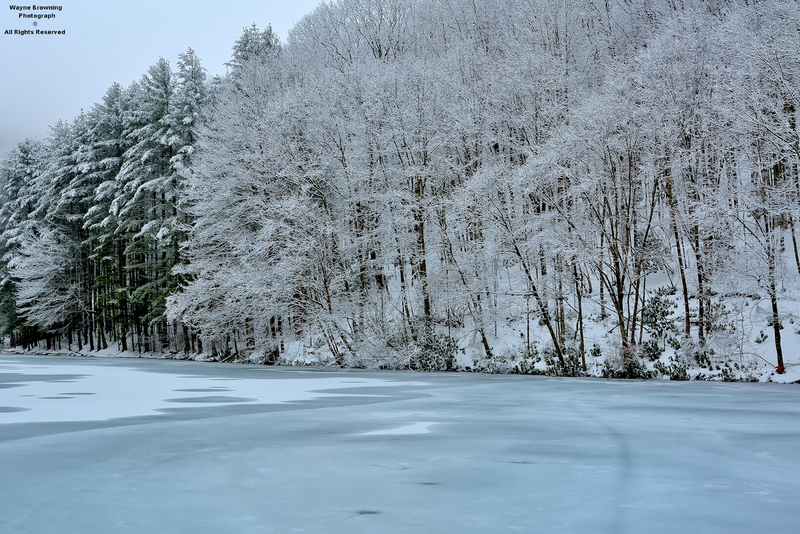 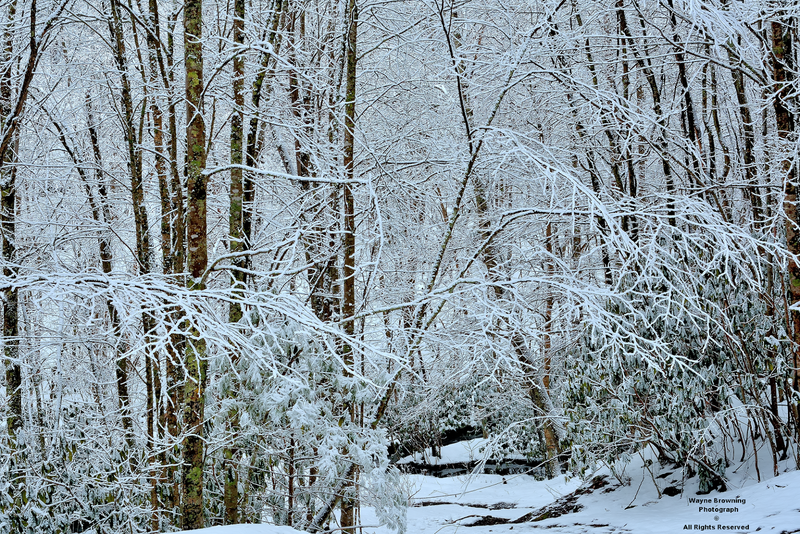 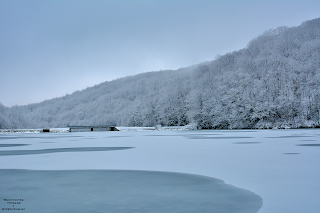 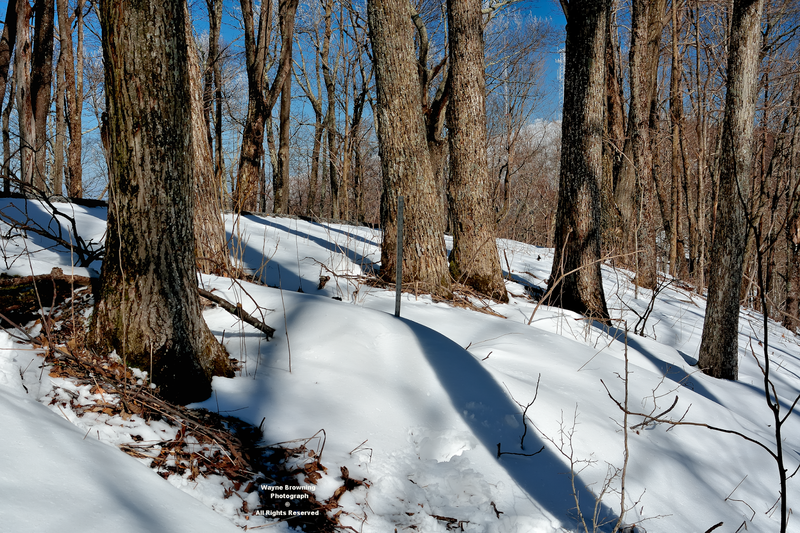 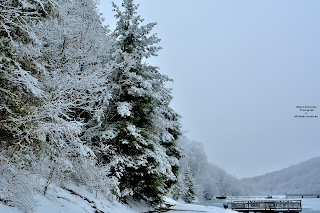 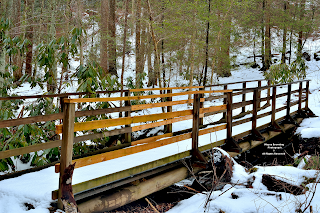 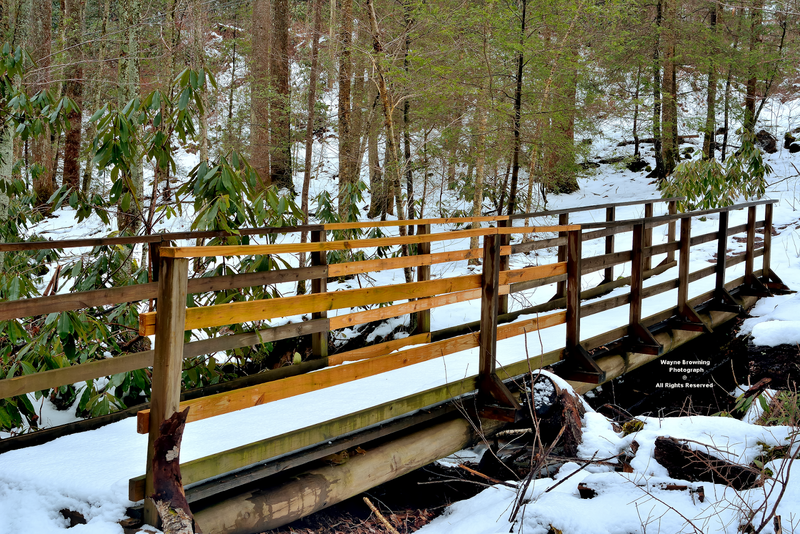 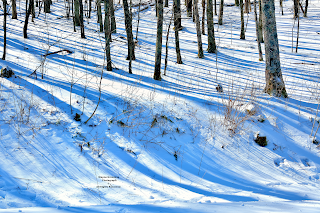 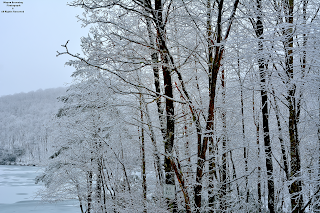 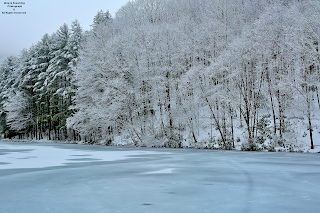 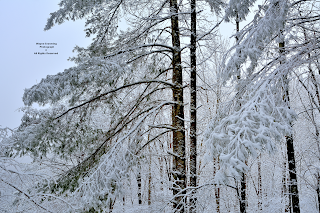 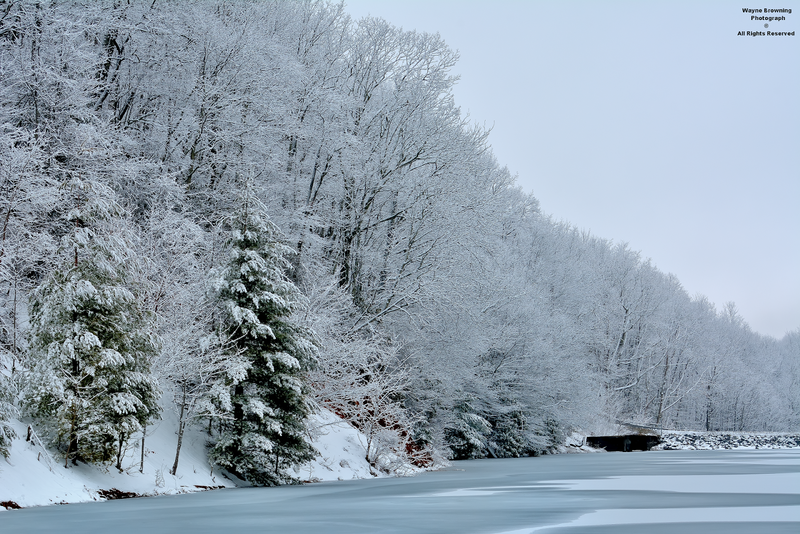 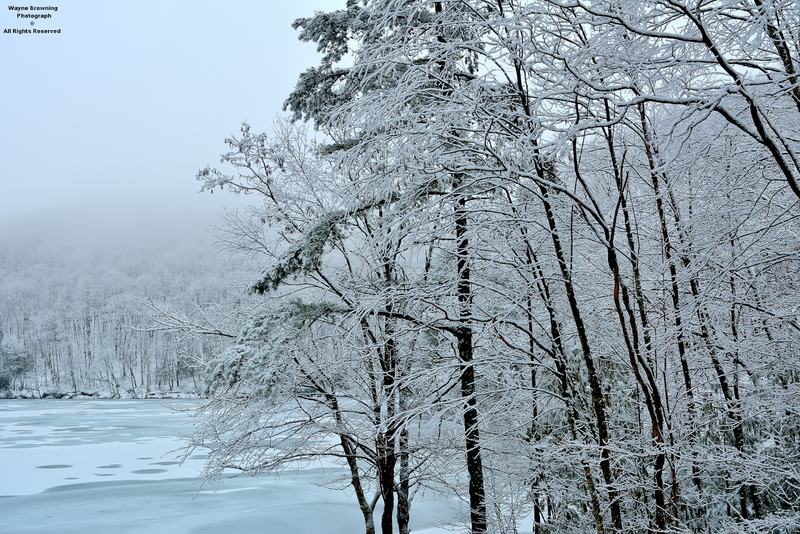 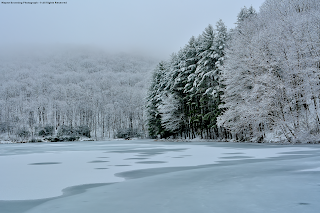 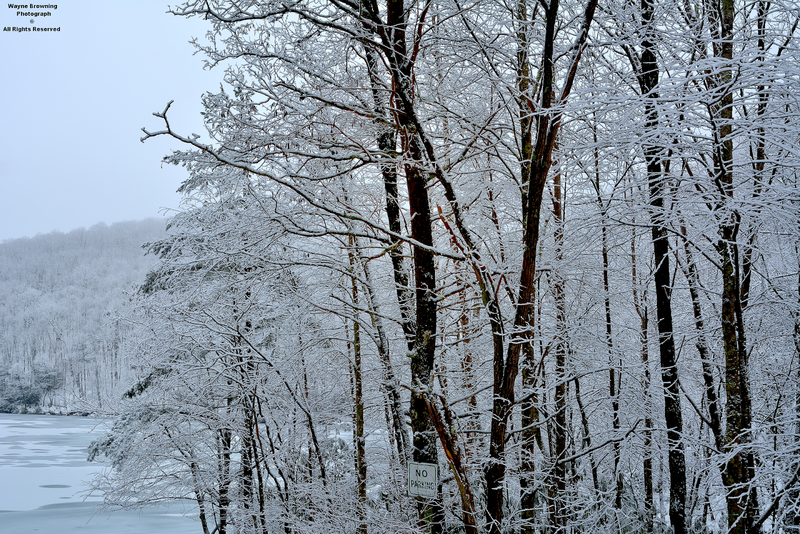 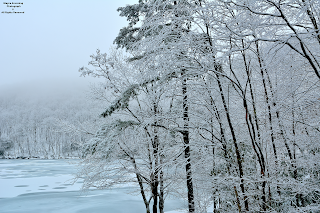 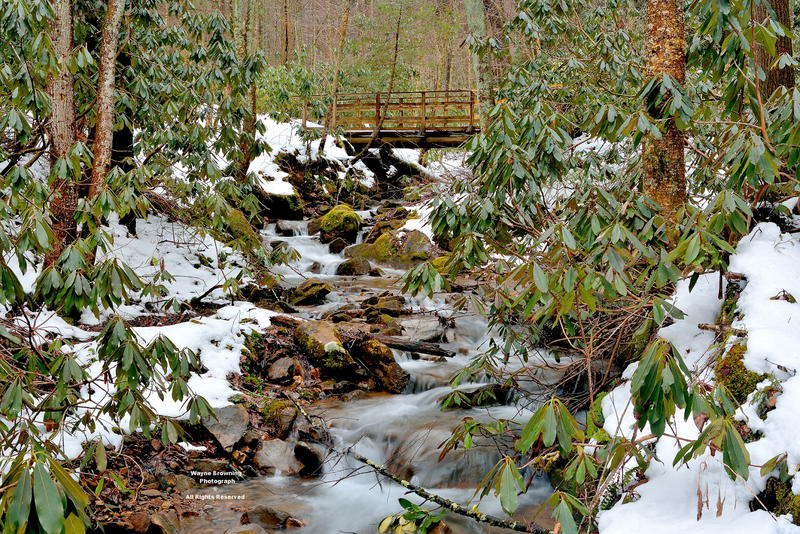 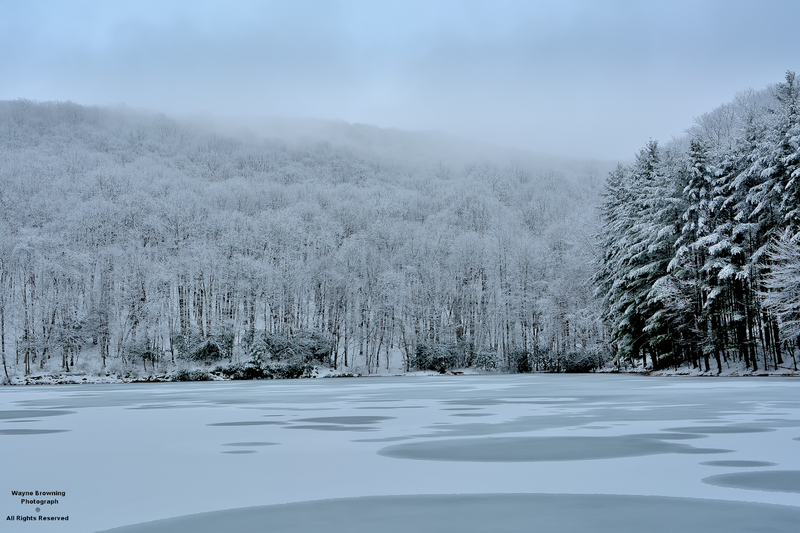 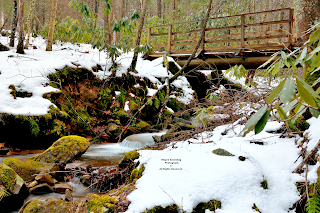 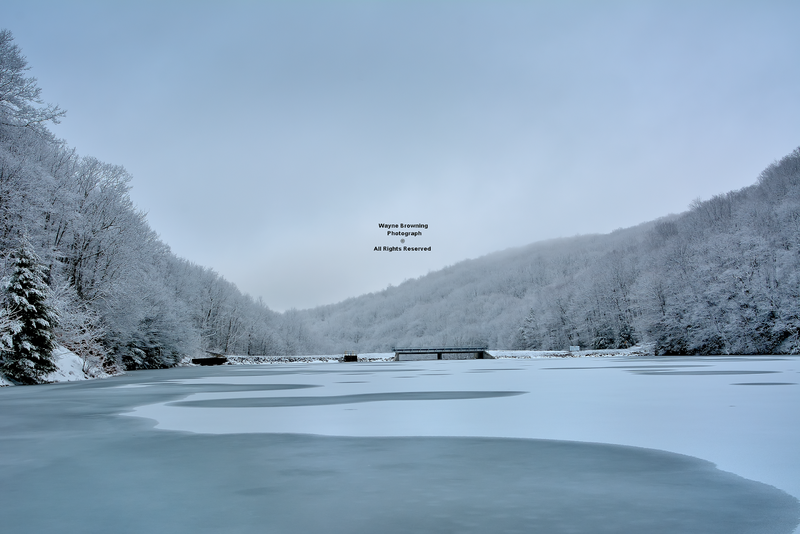 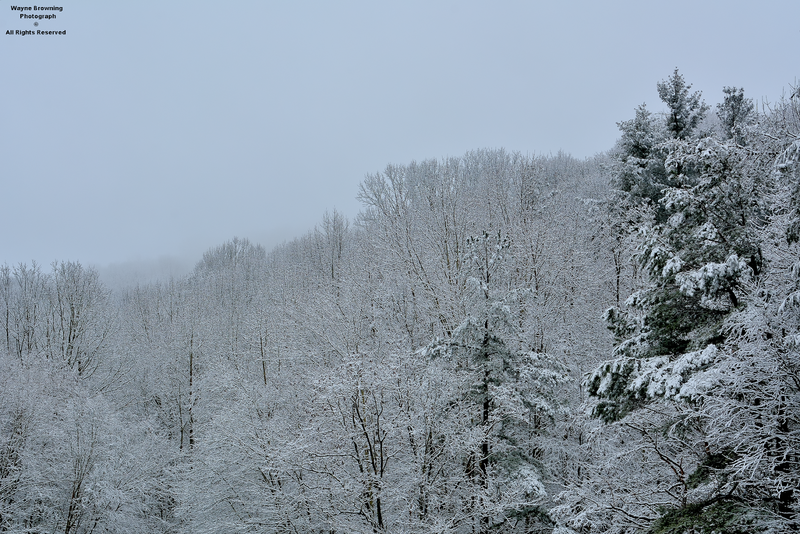 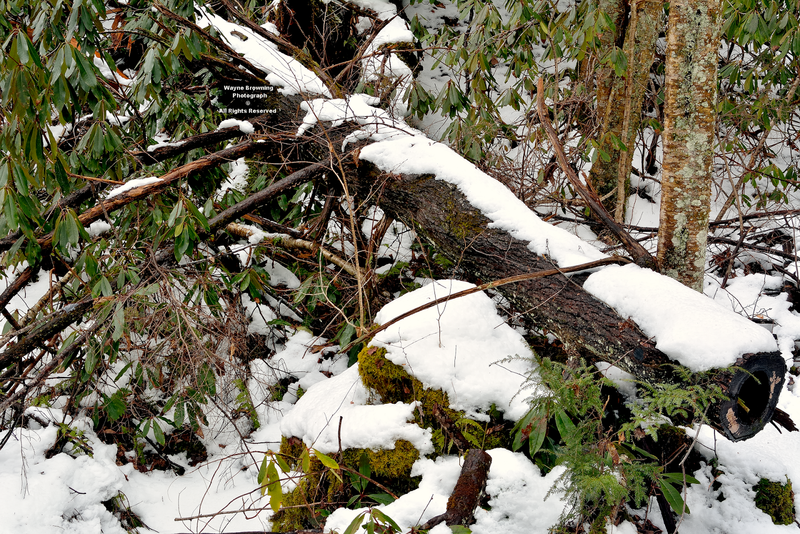 *Most of the snowfall last winter coming via a barrage in February 2015, with approximately 73.0" of snow falling atop the High Knob Massif ( with mean snow depth reaching around 4 feet ). 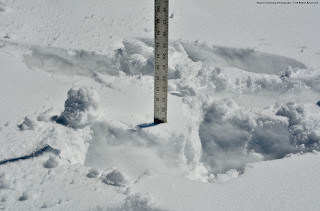 The final 2014-15 seasonal snowfall total being around 125.0" . 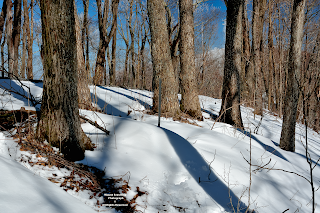 This winter featured much more January snowfall and about 40" of February snow ( vs. 73" last Feb ) with melting in between months, instead of one long and massive release of melt water. 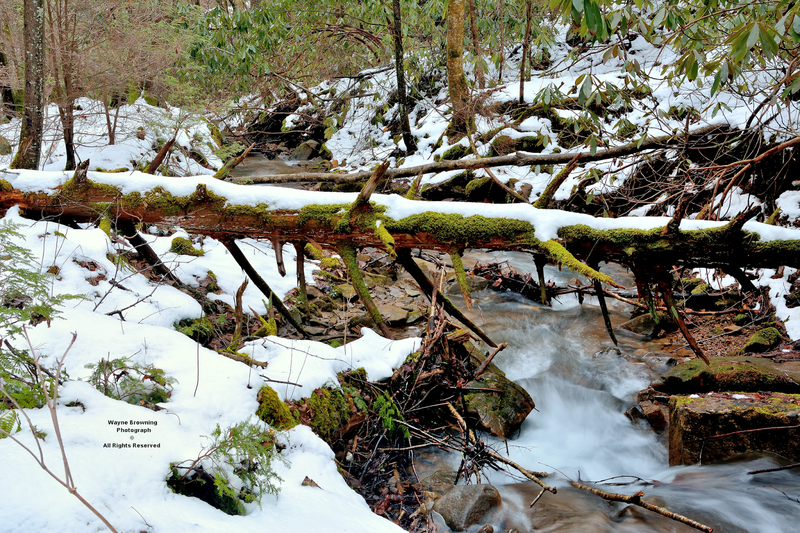 This winter has been significantly wetter than last winter, when adding in rainfall, such that whitewater has been gushing more often than not since late November 2015 ( as the prior graph indicates ). 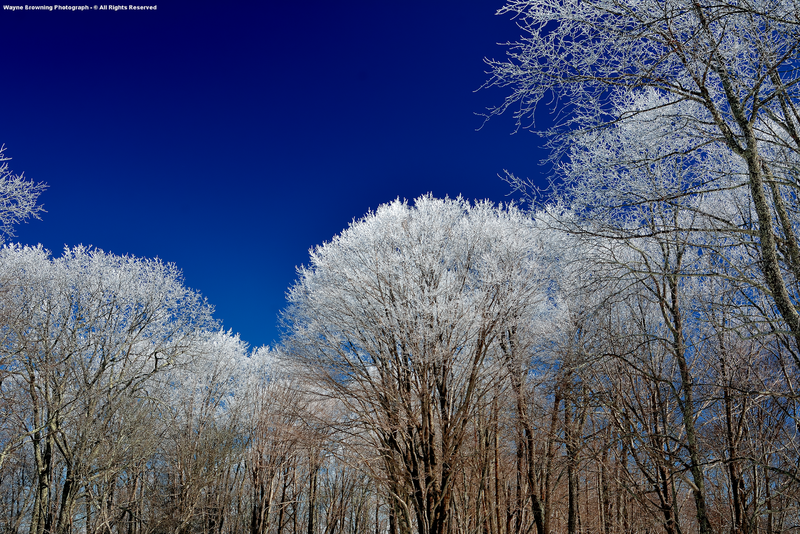 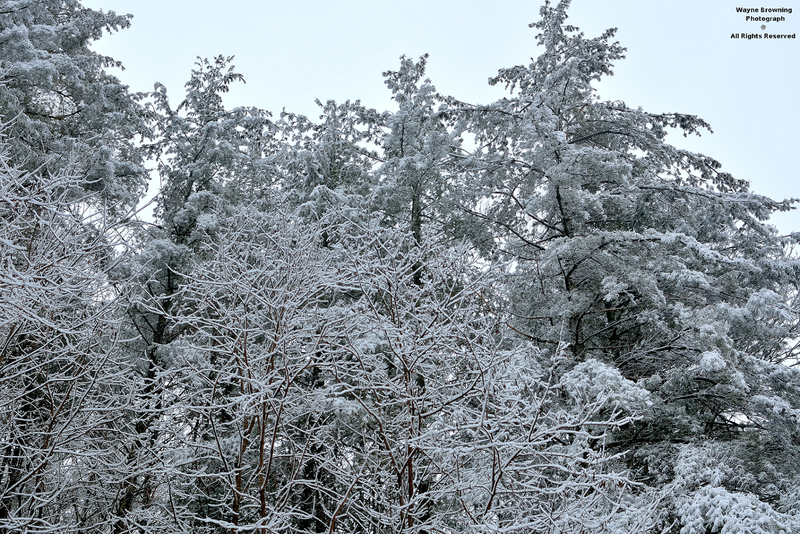 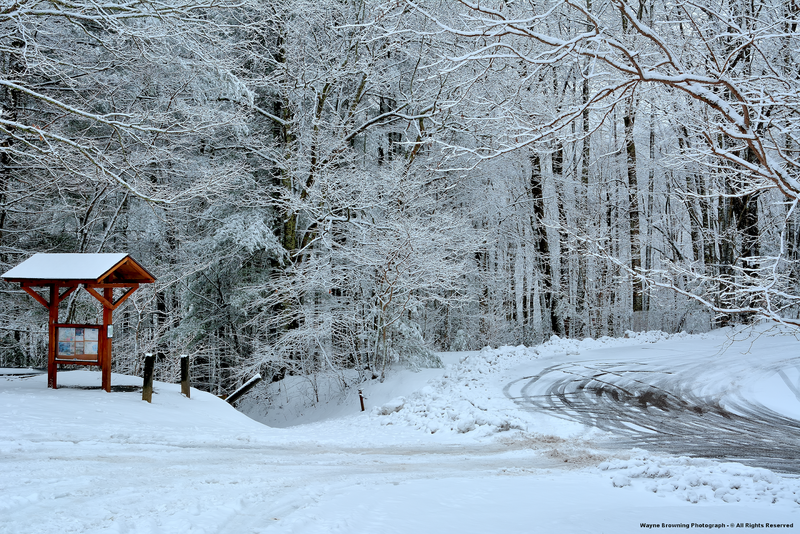 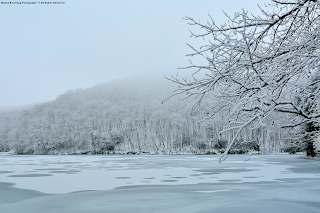 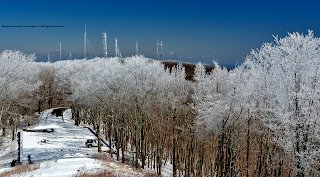 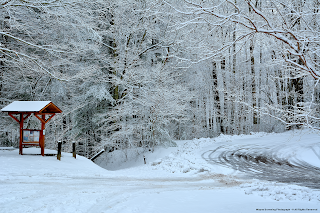 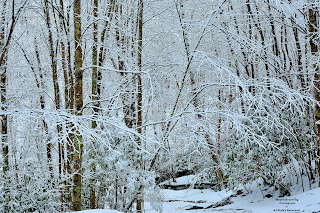 Conditions were simply spectacular amid upper elevations in the High Knob Massif during the late afternoon hours of February 17, following the latest winter storm and prolonged rime formation. 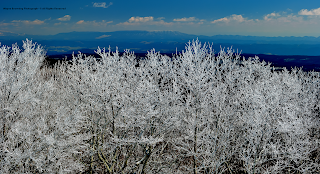 It has been another wet winter in the High Knob Massif with a general 22.00" to 24.00"+ of total precipitation ( rain+frozen forms ) during the December 1 to February 16 period. the month of January 2016. 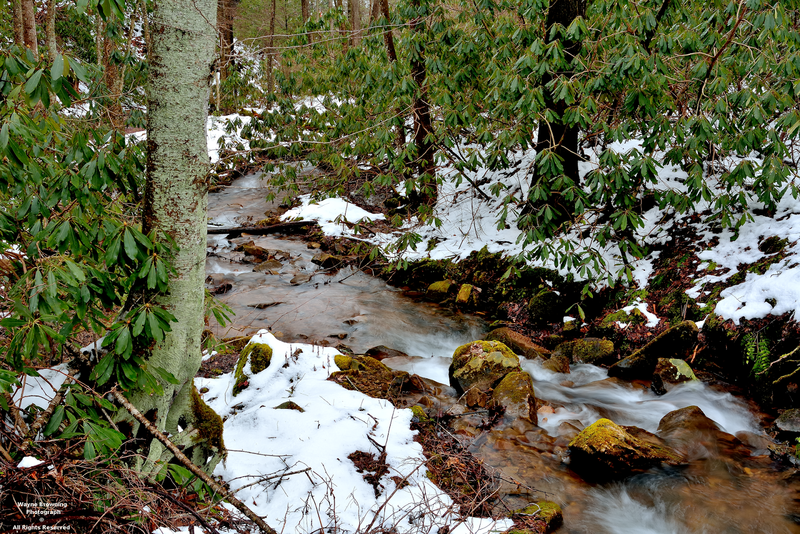 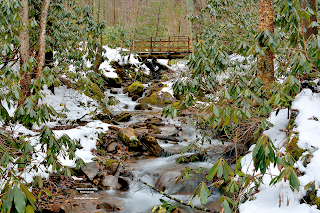 The Big Stony Creek stream gage graph reveals how winter wetness has kept the whitewater rolling out of the high country of the High Knob Massif. 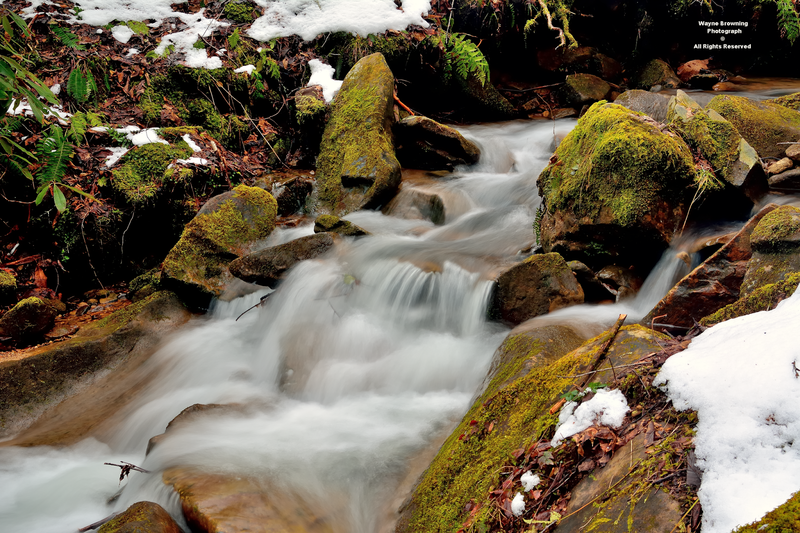 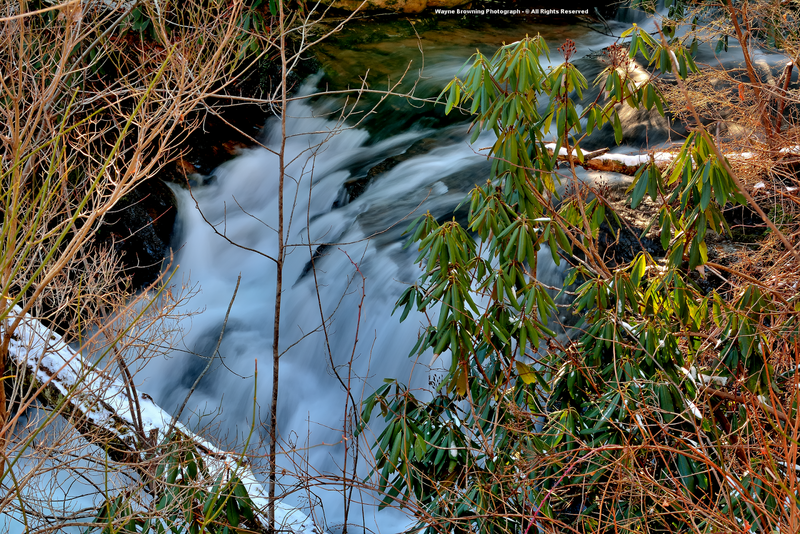 Melt water from significant snowpacks has dominated the flow since January 24, with early February rain also helping to extend the run-off period ( whitewater gushing in the 2-3 foot range and pounding the ground at levels near and above the Red Alert Stage of 4 feet ). 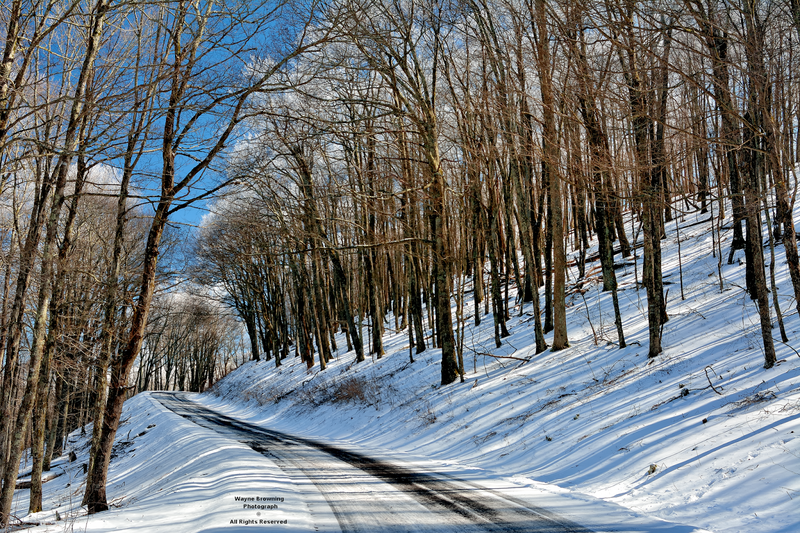 State Route 619 was in good condition up to below the Flag Rock Recreation Area intersection, above which it became increasingly snow-ice covered. 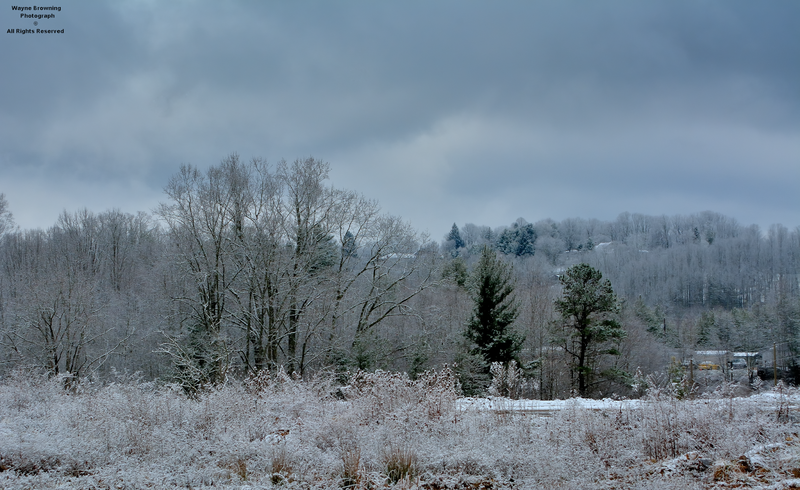 clouds at upper elevations in sub-freezing air. 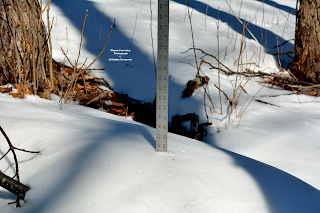 A general 4" to 12"+ of snow depth remains above 2500 feet, so there is much water yet to be released into steep creeks draining the great massif. 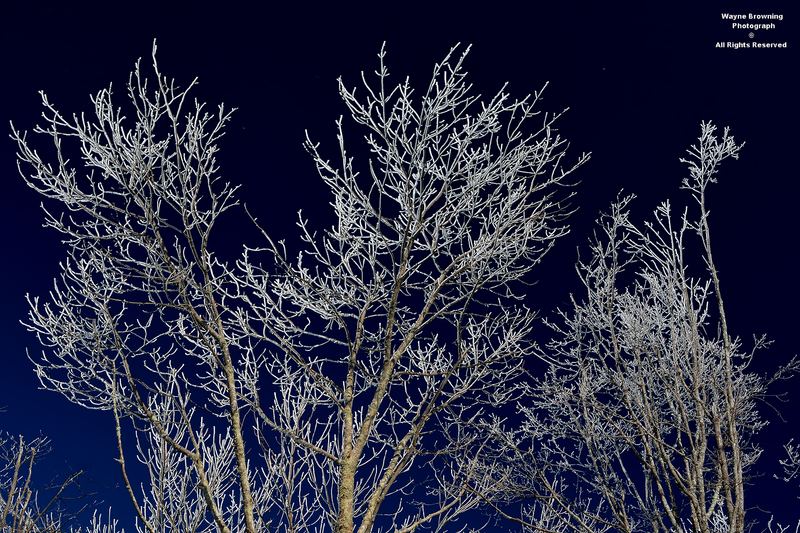 The riming level dropped down to near the base of the massif along northern slopes during this event, with rime formation in the Town of Wise remaining well into the day before dropping off trees. 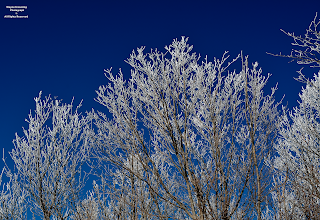 By late afternoon trees at stream level in Legion Park were mostly free of rime, but barely as the riming was visible on all sides just above the whitewater creeks. 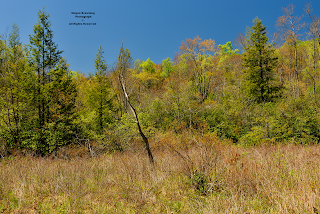 to hear Veery Thrushes ( Catharus fuscescens ) singing at atypically low elevations, amid drainages that funnel cold air downward from upper elevations in the High Knob Massif. 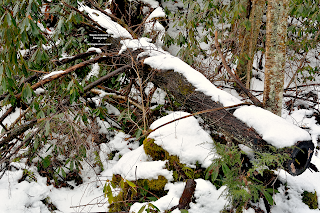 Beautiful Yellow Birch, lichens covered Beech and mossy spirals of dead Canadian Hemlock trees are along the Legion Park trail which runs along a nice whitewater creek draining extreme western sections of Benges Basin.